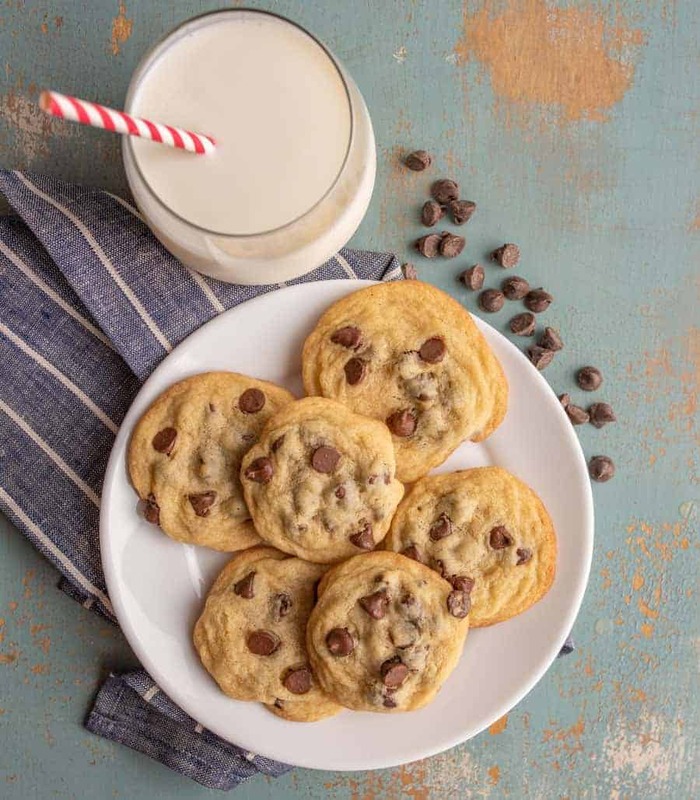 Small batch chocolate chip cookies where the recipe only makes 6 cookies – for the times when you need a good cookie but don’t need a whole batch! Who else loves chocolate chip cookies as much as I do?! They are for sure my favorite cookie, if not my favorite dessert, because there’s just something magical about butter, flour, sugar, and chocolate. 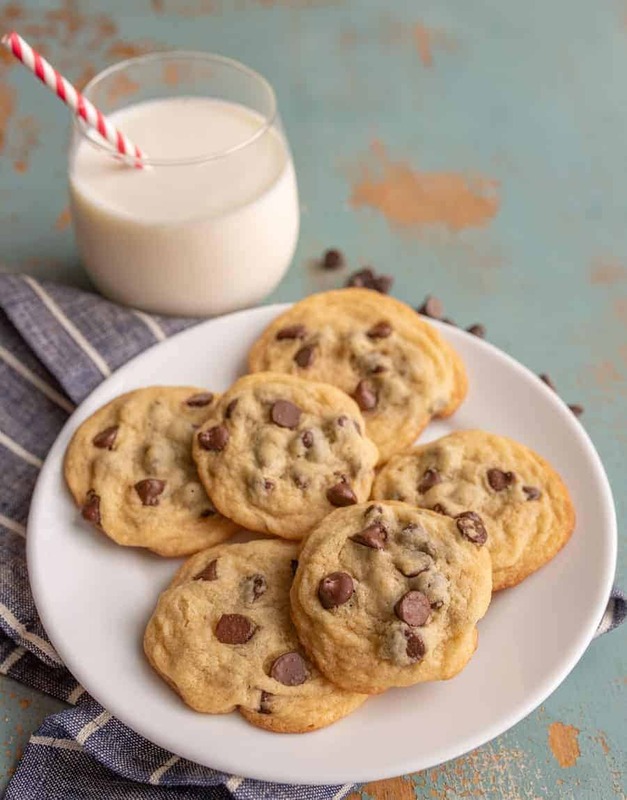 I published this small batch chocolate chip cookie recipe in 2011 and I thought this January would be a great time to bring it out of the archives, rephotograph it, and share it again with you. What does a woman with 5 kids need a small batch of cookies for? Well, sometimes you need a late night treat that you don’t have to share with the kids and you don’t need or want a bunch of leftovers. This is also a great recipe for smaller families, for kids learning to bake, and for anyone who needs a little help when it comes to portion control (that’s me, too). These small batch cookies are awesome because they make 6-8 cookies (depending on how big you make your cookies), and that’s it. They are the perfect texture and so easy to make. I can’t wait for you to try them. If you like a more “cake-like” cookie, feel free to add an additional 1 tablespoon of egg (for 2 tablespoons total) and an additional 1 tablespoon of flour. This produces a fluffier cookie. You can increase the chocolate chips to 1/3 cup if you’d like. Use whatever chocolate chips you like. This recipe will work fine with margarine if that’s what you have on hand. Measuring the butter is the hardest part of this recipe because it’s such a small amount. Be sure to measure the butter correctly or your cookies will be too thin and spread a lot while cooking (it’s happened to me – tastes great but the texture isn’t perfect). If you think you’ve over-measured your butter (your dough will be quite sticky but should be tacky if your measurements are right), just add a bit more flour until the dough resembles a traditional cookie dough, tacky but not sticky. Yes! Let the cookies cool completely then store in an air-tight container in the freezer for up to 2 months. 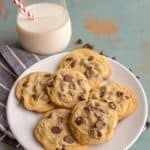 Small batch chocolate chip cookies where the recipe only make 6 cookies – for the times when you need a good cookie but don’t need a whole batch! Cream together the butter and sugars using a fork. A 2-cup glass measuring cup is perfect for this. Break the egg in a small bowl and whisk it well with a fork. Measure out the needed amount of egg and add it to the butter mixture. Mix in the eggs and vanilla. Add the flour, baking soda, and salt to the bowl and stir well to combine. Then add the chocolate chips and stir to incorporate. 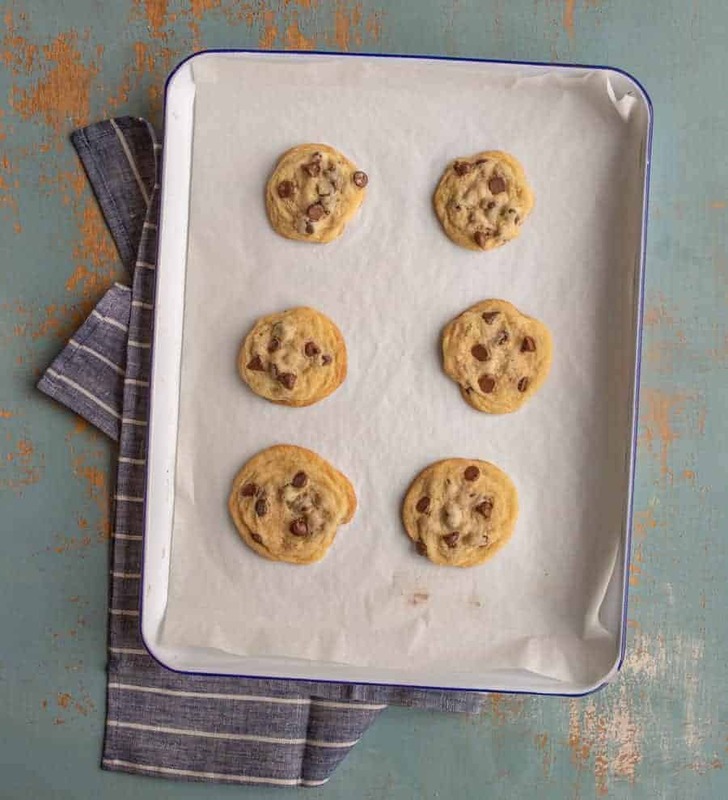 Spoon onto a baking sheet lined with parchment or a baking mat. Plan on 6 to 8 cookies (I always end up with 7 when I use my cookie scoop). Bake at 375 for 8-11 minutes. Let cool on the baking sheet and enjoy! I hope that this recipe is a fun one for you to make, whether you make it on a night to enjoy without the kids or in the afternoon with your kids. 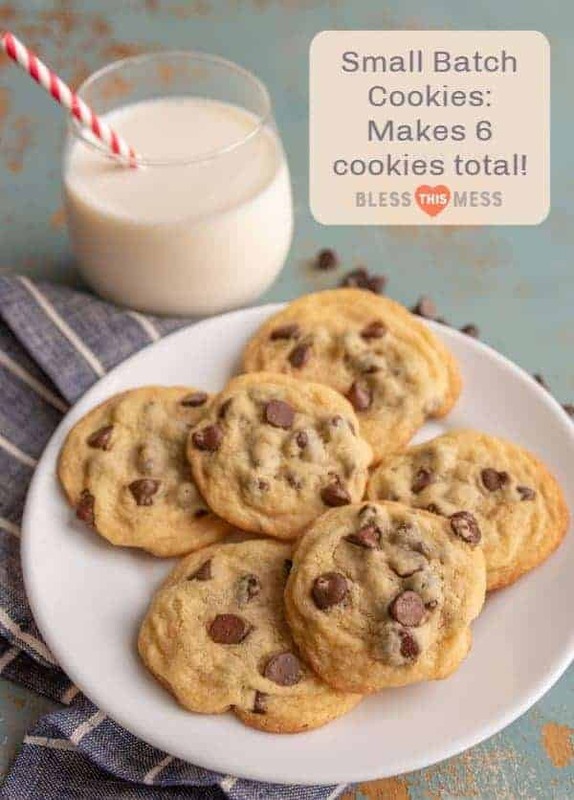 This is a great chocolate chip cookie recipe that just happens to make 6 cookies! Enjoy from my kitchen to yours. 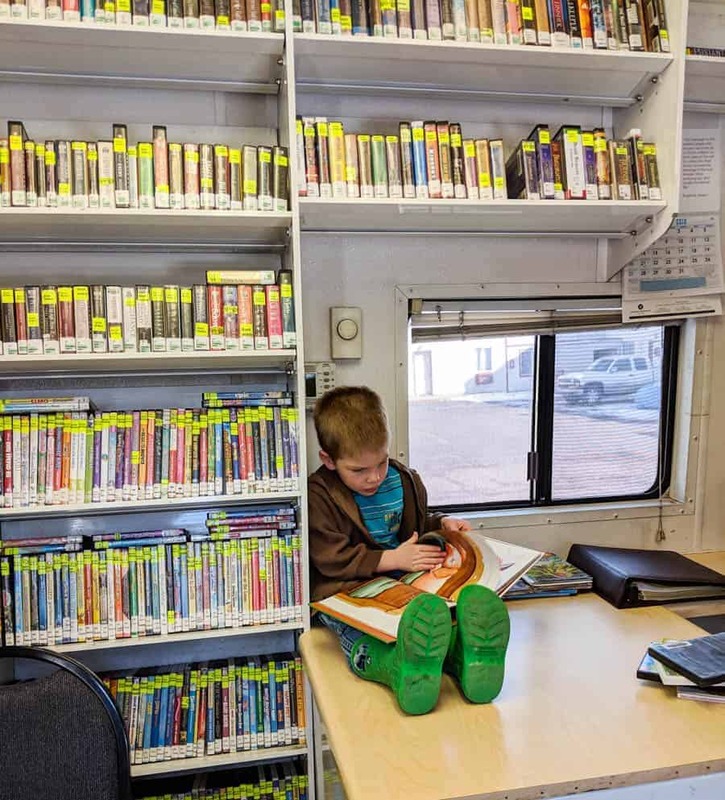 Our tiny town in the middle of nowhere has no library. But what it does have is a bookmobile that pulls into town twice a month. It’s essentially a semi with a library in the back. How fun is that? They do a great job keeping it stocked with books and they even do a summer reading program. Plus the librarian, Lyle, is the kindest man I’ve met. He didn’t even bat an eye when Graham climbed up on his desk to get a comfy seat while my back was turned to help Paul pick out a few more books. I always appreciate people who are patient with my kids as I try so hard to do the same. Thanks for sharing!! I love making cookies with Elizabeth and this is perfect for just a little treat. You can’t freeze chocolate chip cookies……they scream, ” Help, get me out of here now, immediately, pronto!” I’ve tried freezing cookie dough too…..it also screams and begs. No matter where I am in the house I can hear the screams. This recipe sounds perfect for me! I could probably freeze the leftover egg….or just make two batches at once! Chocolate chip cookies are oh so dangerous!!!! Bahahaha, I get you! That’s why this recipe is so great! Happy baking Debbie!